Tehipite Dome lies along the Middle Fork of the Kings River, rising almost 3,600ft in a near vertical fashion above Tehipite Valley. 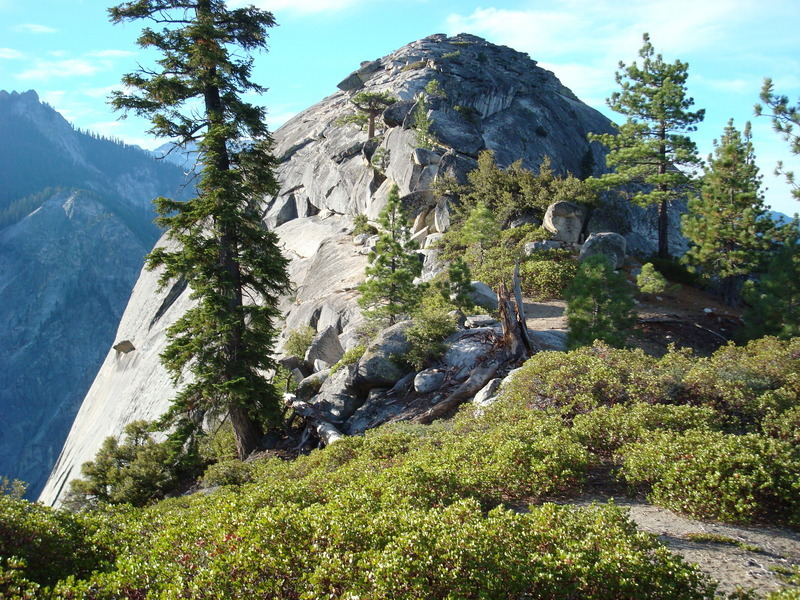 The rock climbing on that face is said to be excellent, though it sees few visitors due to its remoteness in Kings Canyon National Park. Of course I wasn't interested in the rock climbing nearly as much as in getting to the top. The easiest approach is from the west, and the easiest climb is from the north, and the combination is the most often used route for peak baggers. The total distance is something like 28 miles with an elevation gain of about 5,000ft for the roundtrip. Matthew had visited the peak only a few weeks earlier but was unable to reach the summit due to the class 3-4 crux with exposure that he found when he got there. In perusing the trip reports I got the impression that about half of the climbers used a rope belay, the other half soloed it, so I felt I ought to be able to solo likewise. If not, it would be a long haul to fail on a peak. After the usual midnight drive across the Central Valley from the Bay Area, I got started at the Rancheria Trailhead near Wishon Reservoir starting at 1a. It was a fairly cool night, but not too cold, and for the most part I traveled by headlamp in a tshirt. Several creeks I passed on the way to Crown Meadow had flowing water which I used to fill my water bottle. It was dark when I arrived at Cow Camp in Crown Meadow just before 4a. The signs seemed designed to ensure no one camps in the vicinity, but I would have to wait until my return to check things out to see what this place actually was (a camp for cows?). Further along, I had no trouble crossing Crown Creek near Deer Meadow. This was the scene for some wild creek crossings described by Eckert and Secor who chose to do this in early summer. In mid-October it was a non-event and I easily crossed over using boulders without getting wet. Crossing into the National Park boundary (there were two different signs I found about 20 yards apart marking the boundary), I continued on for about a mile until the trail was in the midst of an uphill climb just south of Kettle Dome. It was still dark when I found a lone duck along the trail that I took to mark the start of the cross-country route to Tehipite Dome. Though not a difficult traverse in the dark, it would have been better had I started about 45 minutes later to allow the daylight to help with the navigation. I ended up traversing and dropping too much elevation, finding myself on some psuedo-cliffs as the day began to break. It wasn't terribly serious to get through this section, but it might have been a different story if it had still been dark out. I finally arrived at the north end of Tehipite Dome around 7:20a. Now came the moment of truth - would I find the same trouble getting up to the summit as Matthew? Since it was early morning and I had no rush to get anywhere, I decided to explore all facets of the dome to see what options were available. I first wandered over to the west side a short distance, then up to the ridge crest, then over to the east side. It was a round aboutway to get to the east side as I found shortly thereafter that it is a simple walk from the saddle north of the dome. I found a ledge on the east side that led out to an exposed class 4-5 move, one that Matthew and others had described. I walked out as far as I could do so easily (up to about class 3), but balked at the more exposed moves that would be required to finish it. That seemed crazy for a peak described as class 3 by Secor. It would have helped if I had actually read his description or some of the others, but instead I decided to go back over to the west side to see if I could manage a way up there. There were several possibilities that I looked over. It would have been better had I been presented with a blank wall, for I could have then just given up and looked elsewhere. Instead, I wandered around on some badly sloped ledges trying to make upward progress, getting myself into a bit more trouble than I would comfortably like to admit. After more than half an hour I finally gave up after carefully extracting myself from the situation. I went back over to the east side once again, and soon discovered the key. The trick is to not follow the ledge out to its end where upward progress grows difficult and exposed, but rather climb up to the ridge halfway across the ledge where a small evergreen is located, one that can either be a nuisance or a help, depending on whether you choose to use it to aid you on the sloping block leading to the ridge. This was the same notch I had crossed over in the very beginning, but had dismissed the ridgeline as not likely to go. But in fact there is a class 3 move up a block that leads to the easier scramble to the summit. More than an hour I had spent in figuring out this problem, but at least I now had a thorough knowledge of the scrambling options. And I did manage to get to the summit which was the more important benefit. The summit of Tehipite Dome is an impressive one. The Kings River lies more than 3,000ft directly below the dome on the south side, similar in height to El Capitan in Yosemite Valley, though of course not as widely known. Across the river canyon lies the Monarch Divide, with steep, granite-lined gorges rising from bottom to top almost 7,000ft in height in only a few miles. The Gorge of Despair and Crystal Creek form the two most impressive gorges. Spanish Mtn rises above the surrounding forest to the west while Kettle Dome and Ridge rise high to the north. One certainly has a feeling of remoteness, far from any signs of mankind (if one looks carefully, you can see SR180 winding along the south side of Kings Canyon 8.5mi to the southwest). The register, dating back to 1962, was damp when I pulled it out of the container. The most recent visitors were only two days earlier, summiting in what was described as "heavy snow," most likely the cause of the dampness (there were few signs of snow anywhere two days later). I left the pages out in the open to dry in the morning sun during the time I stayed on the summit, though it was hardly long enough to allow them to dry out. The usual names could be found scattered throughout the register, with a smattering of more serious rock climbers who had taken the far harder ways up from the south. The return was along much the same route as I had taken on the way in, with the notable exception that I avoided the cliffs and bushwhacking in the cross-country portion by traversing along a higher line (I returned to the trail about 100yds above the duck I had found on the way in). Though the sun had shown brightly at sunrise, by 9a or so it was hidden behind partly cloudy skies. The temperature remained quite pleasant for hiking, even as the clouds began to dissipate the further west I traveled. I investigated Cow Meadow (a rustic set of cabins for managing a herd of grazing animals at the edge of Crown Meadow), now closed for the season. There were no cows to be found in the meadow and no humans in the half dozen or so buildings found just off the trail. I heard the bells from cows shortly after returning to the trail, but never spotted them in the forest or among the various small meadows scattered about. I found trout up to 8 inches in most of the streams, surprisingly even in some of the smaller ones that would hardly seem able to support them throughout the year. A baby bear and was startled when I approached and scurried up a tree at one point. Mom wasn't far away, but stayed off in the distance until I had passed and she came back to retrieve her cub. Fall colors were evident in various places along the way, though most notably near Tehipite Dome itself. Overall, it was a very pleasant hike on the way out, unlike the march in by darkness so early in the morning.